TFC announce the release of the world's smallest sub-miniature, low profile, precision OCXO designed by RFX Limited, a subsidiary of TFC; type OS265 - 8.5. The module, packaged in a shielded metal DIL case, only 8.5mm tall, provides exceptional performance combining high accuracy and low ageing with excellent phase noise and is the smallest precision OCXO in the world with this combination of high quality attributes. The incorporation of an SC cut resonator, custom designed for RFX and manufactured by their Canadian subsidiary, produces minimum long term ageing, fast warm up, accuracy from ±0.005ppm with phase noise better than -140dBc/Hz at +100Hz offset making this new OCXO a world leader in its class. The OS265 - 8.5 module sets a new standard in miniature precision OCXO’s exceeding specifications for traditionally large units and expanding the useful applications for this product group. It has been developed for use in Base Stations, Wireless Networks, System Synchronization systems, Instrumentation, Critical timing and Calibration applications and low weight and minimum power consumption make it ideal for portable applications. Supply voltage: 3.3Vd.c. to +12Vd.c. Accuracy: from ±0.005ppm Trim range: ±0.5ppm min. Ageing: ±0.05ppm per year max. The company designs and manufactures standard and bespoke high frequency innovative precision OCXO, TCXO,VCXO and PLL designs from 1MHz to 2.4GHz from its modern production unit based in Livingston, Scotland. 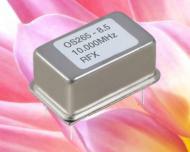 Integral to the company’s ambitions and expansion plans, RFX acquired, in its entirety, Laptech Precision Inc. from Canada in February 2010 providing the company with in-house supply and design expertise for the critical quartz component of each oscillator. The company actively seeks partnerships with customers and suppliers to incorporate new parameters within the RFX design criteria and to ensure sufficient resources are made available to meet future technical and production requirements.